Fishing Equipment This boat is outfitted with all stand-up tackle. Light tackle for reef fishing. Penn 30 VSW's for the middleweights and Penn 50 VSW's (loaded with 1000 yards of 100 lb. test!) and big game harnesses for the big fish. I also have casting and jigging rods on this vessel. 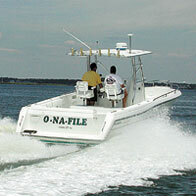 Electronics include fish finder, GPS/chart plotter, radar, VHF and stereo. The "Mega Bites" (like the photo) is a 32-foot Stamas powered by two inboard Yanmar 230 HP turbo diesels and a bow thruster. YES! There is a cabin and an enclosed flush toilet in the boat. Built-in ice chests.